Happy Tuesday all! 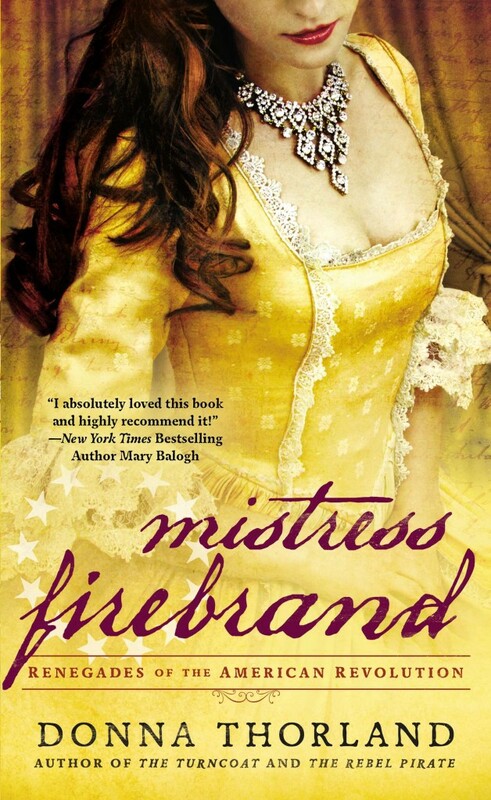 Today on the blog I have an excerpt & giveaway of Donna Thorland's Mistress Firebrand, the third book in her American Revolution series, as part of her blog tour with HF Virtual Book Tours! I hope you enjoy the snippet and good luck to all who enter the giveaway! Severin Devere was standing on deck when the case of Madeira was hoisted aboard the Boyne. He considered sending the crate back to shore, but that would only attract more notice, and drawing further attention to the crippled man-of-war in New York Harbor was the last thing he wanted to do. He had been sent to America for the purpose—among other things—of fetching John Burgoyne home quietly and discreetly. The King and Lord Germain, the secretary of state for America, had read Burgoyne’s letters from Boston describing the fiasco of Bunker Hill—for which he had been present but not in command—and his proposals for pacifying the colonies. They had found these observations full of good sense. Now they wished to hear more, preferably without alerting the Rebels to their intentions. Unfortunately, John Burgoyne did nothing quietly or discreetly. Severin’s faint hope that the general had exercised a modicum of good judgment in his transaction with the wine merchant was dashed when he broke the seal on the receipt that accompanied the crate. Burgoyne had bought the Madeira under his own name, which meant his departure from Boston was no longer secret. The other letter that had come aboard with the wine was also addressed to Burgoyne. It was sealed with cheap wax, written in a round, girlish hand, and scented with a whiff of scandal. Marvelous. Severin pocketed the missive and descended below deck to the general’s cabin. Four lieutenants had been displaced to create Burgoyne’s apartment, and part of the wardroom had been cannibalized. Captain Hartwell had balked at removing any of the guns, though, so Burgoyne had draped the thirty-two-pounders with thick furs and Indian-tanned hides and brightly beaded garments he had bought as souvenirs. The general sat at his breakfast table wearing a striped silk banyan and an embroidered turban. His slippered feet rested upon a Turkey carpet. On the table alongside the serving dishes was spread a map with a carefully penciled line running from Quebec to Albany. This was the contradiction in Burgoyne’s character that fascinated Severin. The man had an appetite for luxury, and a tendency toward egotism and bombast, but he wasn’t lazy. A few years past fifty, he had the vigor and ambition of a man half his age, evident in his still black hair and avid, heavy-lidded eyes. “Your wine has come aboard,” said Severin. He dropped the two letters on the table beside Burgoyne’s notes and gestured for the servant to leave. The man scurried from the room. 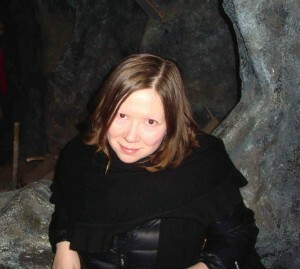 “Excellent,” said Burgoyne, slicing into a chop. He meant his farce, being rehearsed for a benefit night at Faneuil Hall, though Severin had never known the proceeds of such events to reach any of the advertised widows and orphans. “Give me leave to doubt the noteworthiness of a general missing the odd theatrical event when his country is at war,” said Severin. Severin’s Mohawk ancestry was one of the reasons he had been chosen to fetch Burgoyne, so he might advise the general, who desired to employ native allies in his proposed campaign next year. The difficulty was that Burgoyne had proved disposed to respect the opinion of an Englishman—any Englishman—on native questions more than that of a man who had lived among the Mohawk, especially one the general believed was tainted by Indian blood, like Severin. “And now he will make up his loss on the wine by peddling the news that you are in New York. For those alert to affairs of consequence, your recall to London will tell them all they need to know about the character of the next campaign.” Generals Gage and Howe had always treated the colonials like brothers, because they were decent men and they had ties to America. They were doing everything within their power to avoid bloodshed and bring about a peace resolution to the conflict. “Gentleman Johnny” Burgoyne would not. It was a widely held opinion that the Americans were spoiled children, that a show of force was all that was needed to bring them into line. Severin drew the other letter from his pocket. In the close quarters of the cabin he discovered that it was scented with more than scandal. It had a hint of orange about it. Not the sophisticated tincture of neroli, but the bright perfume of freshly peeled fruit. It made Devere long for uncomplicated pleasures, for warm summer afternoons far from war and intrigue. For a moment, Severin did not want to part with the smooth, scented envelope. For more information visit Donna Thorland's website. You can also find her on Facebook, Twitter, and Goodreads. 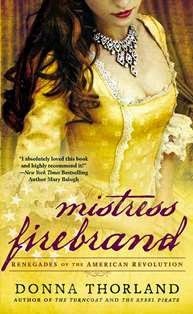 To enter to win a paperback copy of Mistress Firebrand please leave a comment below with your email address. – Giveaway ends at 11:59pm EST on April 24th. You must be 18 or older to enter. Romance, war, and intrigue. I would love to read this! Love and war! Thanks for the giveaway! Thank you for the giveaway. Sounds like an exciting story. Love across the battlelines. I don't normally like the colour yellow, but that is a very striking cover! Sounds like a lovely book. :) Enter me please.